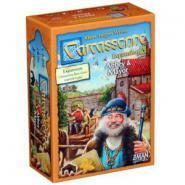 Now traveling merchants transport their goods to surrounding cities and monasteries. The cities in the surrounding countryside can increase to a size large enough to elect their own mayors. Simple farmers build large and wealthy farms and the church tries to strengthen their influence by establishing abbeys. 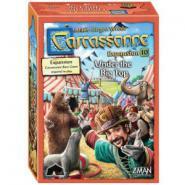 Capturing the thrills of the circus, Under the Big Top incorporates two new types of land tiles and two new types of meeples into the Carcassonne library. Choose to rule the city or patrol the roads and gain bonus points with the new king and robber tiles. Only a king can rule a large city. 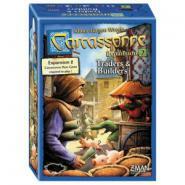 Grow your city and claim the king tile for bonus points.